Where have I been? Well, first there was another spate of chaos deadlines at work. Then it was the beginning of Birthday Week here in the String household (they’re 7 years and four days apart, with mine shortly thereafter). And to no one’s surprise, I came down with a nasty flu. I’m not yet over that, but it was severe enough for me to stay home from work – something I’ve done only once or twice in the last decade. We were hard pressed to find enough room for the obligatory birthday candles. The cake and decorations however were delicious. I did manage to make some progress on the lace scarf over the last week. I’ve finished the center section, and am working on the edging. It looks like I’ll have to nip into my third skein of Prescott, so I’m thinking of pausing on the edging to go back and add some length to the center section before lapping all the way around that last end. I’m not doing anything fancy here – no mitered corners. I’m just working an extra repeat of the pattern into the cornermost stitch, and hoping that all blocks out evenly later. 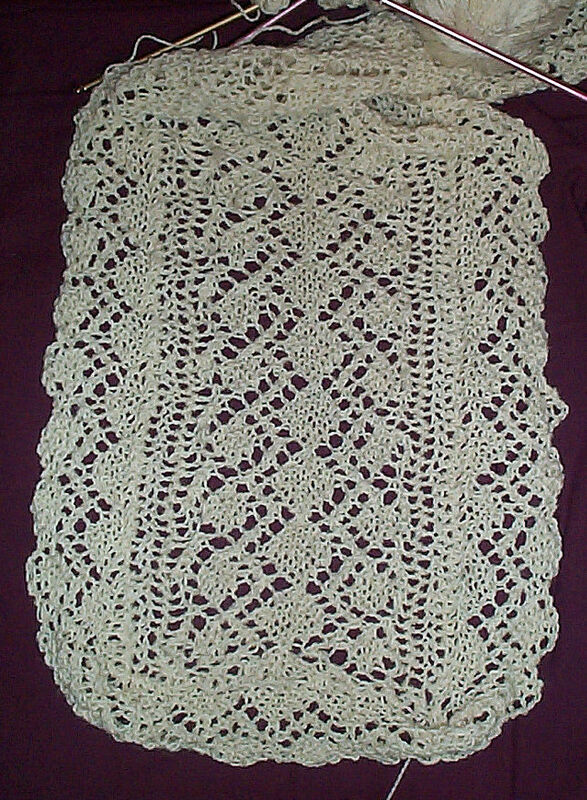 UPDATE: THE LACY EDGING BELOW IS NOW AVAILABLE AS A SINGLE PATTERN DOWNLOAD UNDER THE KNITTING PATTERNS LINK, ABOVE. Knitting an edging onto a piece isn’t difficult. It helps if your base item was worked with a slip stitch selvage edge, but that’s not mandatory. I’ve knit edgings onto all sorts of things, including finished fulled/felted items, fabric, and leather (some caveats on this, below). The slip stitch selvage just makes it easier. Your chosen trim will have one edge intended to hang free. Most often that will be dagged, serrated, scalloped or otherwise fancified. It will also have one (more or less) straight edge. This straight edge is intended to be sewn or knit onto something else. I like to work in the orientation shown in the knit sample and pattern, above – with my straight edge on the right, and the fancy edge on the left. My right-side rows commence from my main piece outward, and my wrong-side rows return from the fancy edge back to the main piece. 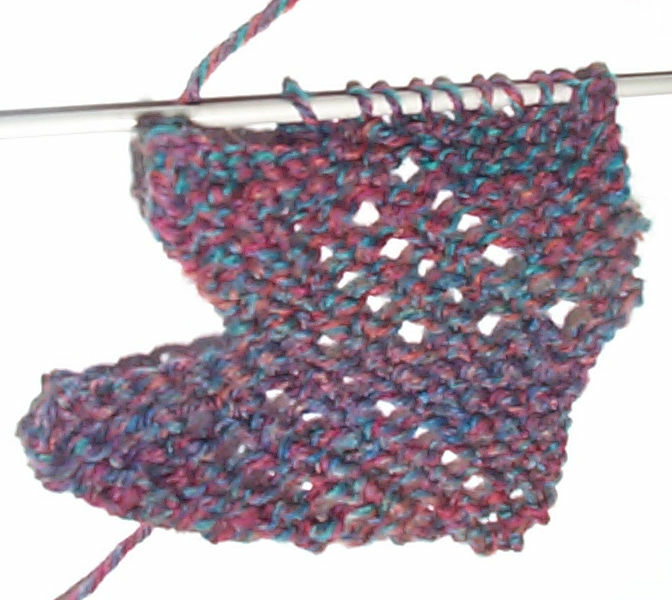 Sometimes I use a provisional cast-on and start my lace rows immediately after it. Other times I use a half hitch cast on, then work one row back in knits before starting my lace patterns. There’s no real rhyme or reason here. It’s just what I felt like doing at the time. In this case, I cast on using half-hitch, and worked a row of knits back, working my first join on that “back from cast-on” non-repeated row. The join itself is quite simple. When I get to the last stitch of my wrong side row, I pick up one stitch in the edge of my established body piece. Then, for the first stitch of my right-side lace row, I either knit or purl that newly created stitch along with the next stitch after it on my needle. If I knit those two together I end up with a neat column of stitches that makes a visual line between the lace edge and the main body. While this can be desirable in some cases, it does present a different appearance on the front and reverse of the work. Because the lace center of this piece is garter, and the edging is also presented in garter, I used a P2tog to make the join. The front and back of the work look less different from each other if I purl the join instead of knit it. Once the join is made, I work out the remainder of my right-side lacy row, and the return row. So long as I remember to pick up one stitch at the end of every wrong-side/return row, then work that stitch together with the next one as I begin the right side row, my edging will be firmly united with my main body. Sometimes you don’t want to do a row-for-row join. Occasionally the stretch of the lace edging or the ratio of the edging rows to body rows isn’t 1:1. 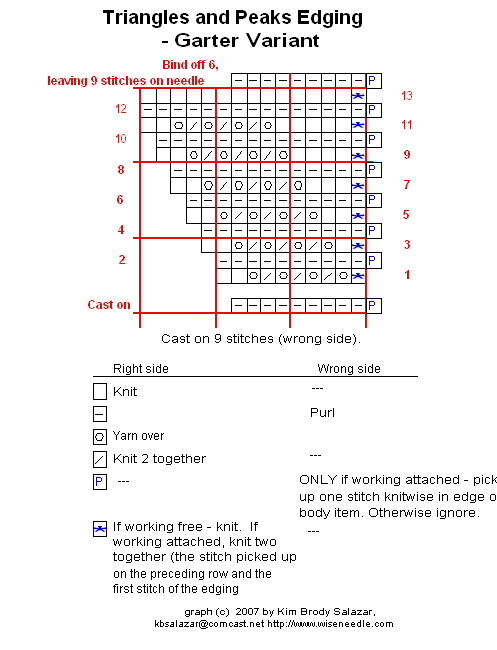 This might happen if you are working the edging on smaller needles; or if you are working the edging across a row of live stitches (or across the top or bottom cast-on or bound-off edge) rather than along the “long side” of the work, parallel to the main body’s knitting. In that case you may need to either work additional non-attached lace rows every so often, or pick up at the end of the wrong-side/return rows by knitting two body stitches together, again every so often. The former adds more length to the lace, the latter subtracts width from the body. Which method is used depends on the stretch of the body. The biggest caveat in attaching knitting by knitting on rather than by seaming is that if you do so, the lace is no longer “portable.” Let’s say in a fit of Suzy Homemaker frenzy, you edged out a set of exquisite hand towels. It’s now some years later, and your children have stained those towels beyond recognition, but the edging still looked good. If you had knit the edging separately and seamed it on it would be very easy to remove and re-apply to new towels. But even if you had run a band of slip stitch crochet down the edge of the towel to provide an easy edge for attachment first, if you had knit that edging onto the towel, removing the fancy lace from the towel will be …problematic. As far as knitting onto fabric, fulled material or leather – it CAN be done. If the edge can be pierced by a needle tip (or was conveniently punched beforehand), you can knit right onto the edge of anything. BUT the warning about not being able to take the lace off again or adjust it later is strongly in effect. If you want to attach a lace edging to any of these substrates, it’s worth it to work one row of slip stitch or single crochet along the item first, then knit (or seam) your knitted edging onto that crocheted foundation row. The foundation row of crochet gives you a stable, evenly placed line of stitches for the joins, and stabilizes the base item’s edge somewhat. It also (in the case of leather) makes working into previously punched holes easier (a crochet hook is much easier to thread through and grab a strand than is a knitting needle’s tip). Plus, if you think the item being trimmed might shrink, consider seaming rather than knitting on so you can make adjustments later. In any case, back to sniffling and a nice lie-down. 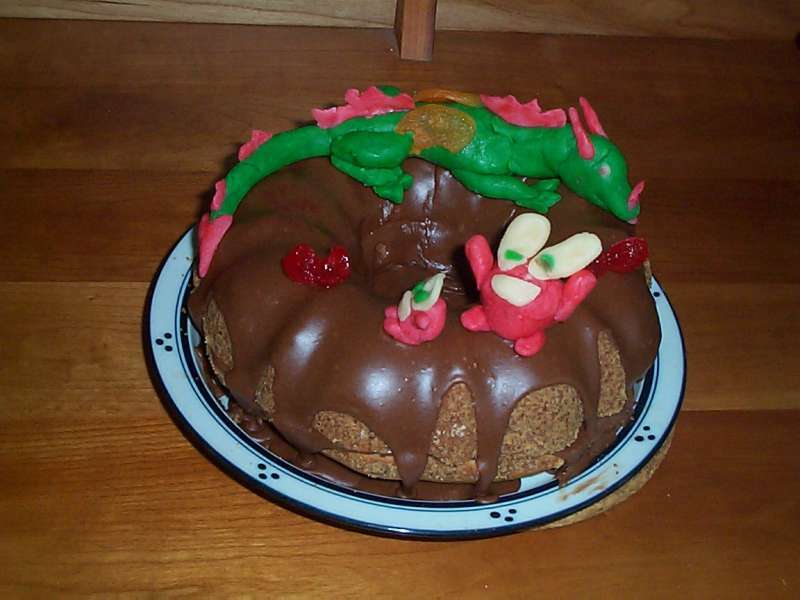 Love the dragon cake. Thanks for the lace attachment info. And I hope you’re feeling better.